The bold and modern looking Cork-First Pendant has seven sculpted ‘feathers’ converging on a diamond encrusted ‘cork’. A link behind the topmost ‘feather’ attaches the pendant to the necklace. The Cork-First Pendant hangs on an angle giving the impression the shuttlecock is mid-flight. The Cork-First Pendant is 925-silver. 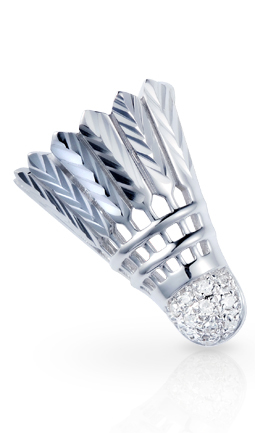 12 small diamonds are set in the shuttlecock ‘cork’.